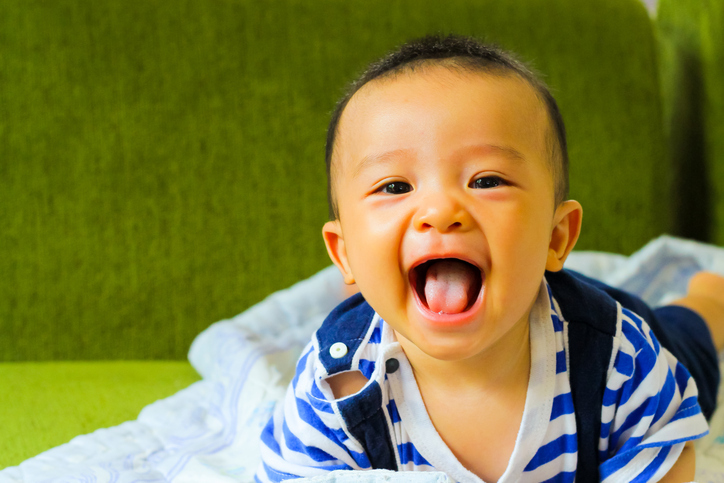 We polled moms on how they make their babies laugh - here are our favorite responses. Bounce a soft rubber ball off of my head and make a sound like an otter. Put blocks on our heads or on his head, and then pretend to sneeze and make the blocks fall off. Play tag - I crawl after her, she runs after me. Drop something and make a weird noise. Sniff in her ear like a puppy dog. Make a low to high pitch sound and do that while my face is coming towards his. Act like I fell down. Pretend to eat his ribs. Make snorting noises like a pig. Blow on the baby's toes. Dance to music in the mirror. Take his hands to tickle his own belly. Make knocking noises with my tongue. Dance around like a chicken. Let him chase me around the house. Great exercise!